Clarksville, TN – The haunting moors of England will come to life at the Roxy Regional Theatre in the enchanting musical “The Secret Garden”, playing November 13th through November 27th. Based on the enduring family classic penned over a century ago by Frances Hodgson Burnett, this Tony Award-winning musical, with book and lyrics by Pulitzer Prize-winning playwright Marsha Norman and music by Lucy Simon, soars to new heights under the direction of Tom Thayer. 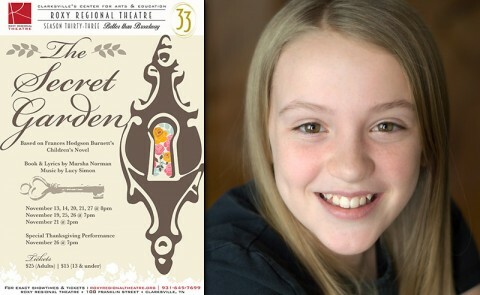 “The Secret Garden” at the Roxy Regional Theatre stars Virginia Richardson. Virginia Richardson stars as eleven-year-old orphan Mary Lennox, who comes to live with her mysterious Uncle Archibald and her sickly cousin Colin. With the help of her charming new friend, Dickon, Mary rejuvenates the house, its inhabitants and its neglected secret garden in this heartwarming tale of forgiveness and renewal. Featuring Ryan Bowie as Archibald Craven, Tanner Sigears as Colin, and James Hansen as Dickon, the cast also includes Kelley Barker, Leslie Greene, Sean Michael Jaenicke, John McDonald, Lindsay Nantz, Val Roche, Matthew Smolko and Jonathan Whitney, with Tom Thayer on piano. Friday, November 13th, is the traditional pay-what-you-can preview of “The Secret Garden”. All tickets not pre-sold at the regular ticket price will go on sale at 7:30pm that evening for a $5.00 minimum. A special Thanksgiving performance on Thursday, November 26th, at 7:00pm will include complimentary pie and coffee with the cast. “The Secret Garden” plays November 13th, 14th, 20th, 21st and 27th at 8:00pm, November 19th, 25th and 26th at 7:00pm, and November 21st at 2:00pm. Tickets are $25.00 (adults) and $15.00 (ages 13 and under) and may be purchased online at www.roxyregionaltheatre.org, by phone at 931.645.7699, or at the theatre during regular box office hours (9:00am to 2:00pm, Monday through Friday, and one hour prior to curtain). Active-duty military, APSU students and CitySaver coupon holders can receive two tickets for the price of one to Wednesday and Thursday performances. This production is made possible in part through the generous support of James Holleman, Jim & Dottie Mann, Starlene Shackelford Sykes and Mary Nell Wooten. The Roxy Regional Theatre is located at 100 Franklin Street in Clarksville, TN. ©2008 Discover Clarksville, Clarksville TN Web Design and Hosting by Compu-Net Enterprises.